The species is widespread throughout most of Britain and, indeed, throughout the entire Holarctic region. H. signifer is commonest on heathlands and grasslands. On sandy heaths it occupies much the same habitats as D. cupreus, and is often found under scattered stones, discarded rubbish and in grassy tussocks. 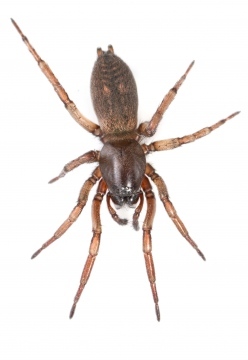 At first glance, the spider suggests that it might be a Drassodes species. In fact, for many years, H. signifer was known in Britain as Drassodes signifer. It gives the general impression of a plump, uniformly coloured spider, whose colour can vary from brown to almost blackish brown. Adults occur between April and September, with the peak between early to mid-summer.